This update fixes some outstanding issues, and lays some groundwork for some upcoming things. There are a few new things this time however. There are no updates for applications on iOS/Android/Windows Store at this time. Already updated my Prime. It's good to go. Good work HP. Your work does not go unrecognized. Je viens de télécharger les mises à jours depuis le logiciel de connectivité, après la mise à jour du logiciel, j'ai demandé une mise à jour de la calculatrice, mais le logiciel me réponds qu'il n'y en a un pas de disponible. Pourtant dans le dossier Micrologiciel j' ai bien la dernière version. Ma calculatrice est une HW A.
I just downloaded the updates from the connectivity software, after updating the software, I asked for an update of the calculator, but the software answer me that there is not one available. Yet in the folder Firmware I have the latest version. I am under windows 10. My calculator is a HW A. Did the connkit download them directly? If not, just let it do so. Merci Tim cela a fonctionné correctement. C'est l'ancienne version du kit de connectivité qui m' avais téléchargé le micrologiciel et placé celui-ci dans le dossier. Petite question subsidiaire : peut-on avoir des précisions sur ce nouveau modèle de Prime annoncé. Thanks Tim it worked fine. This is the old version of the connectivity kit that had downloaded the firmware and put it in the folder. Small subsidiary question: can we have details on this new announced Premium model. 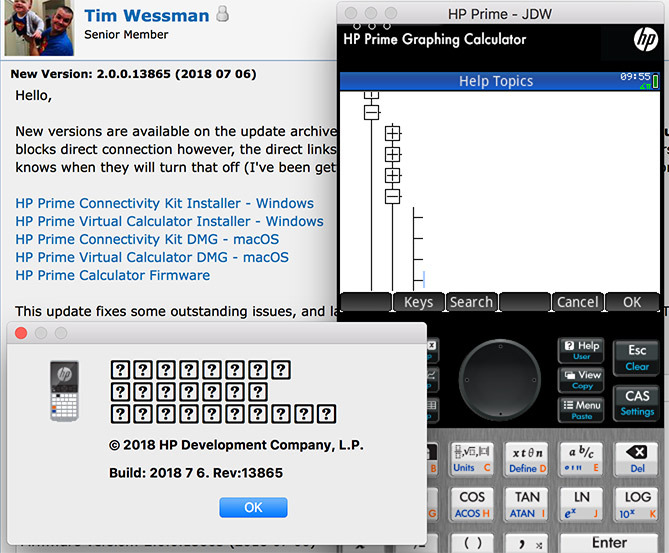 My “old” HP Prime will not update to version 13685. SW = 2018 02 12 (13441). ConKit is updated to 13865. The updates for the Prime are downloaded and are in the Firmware directory in PrimeG1 and PrimeG2. My Prime is indeed updated (likely) and ends with X^2 + Y^2 = Y. After updating, the update pop-up screen comes back in the ConKit. My Prime has not been updated, it still indicates version 13441. Up to now, all updates went well. What’s surprises me is that in the update pop-up screen at "what has changed" the text belongs to the previous version 13441, it’s also wrong in the file release_info_EN.html. By the way, release_info.txt has the correct text. Will the update not work for HW-A? My Prime updated without a hitch, pretty much as usual. Thanks very much for all your attention and support here! I have bought HP Prime Pro Android app and I'm sad about no updates for the app now. Since FTP will be blocked on Google Chrome, where I can download the PC Simulator and Connectivity KIt??? What is HP Prime G2??? I've an issue with Carlos'solar system. I only have the half planets ?! Surely a configuration problem but I don't see where. Do not worry, it's not a bad configuration, it's a problem with the current firmware dragged from the last betas. The video had to be done with a previous firmware. 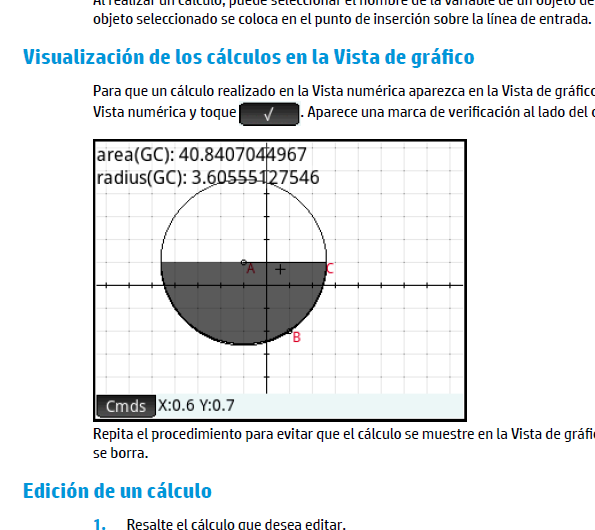 Even in my language the user manual shows it. It's just a problem with filled circles. Do you have any info about the new G2 hardware ? Any speed improvement ? Any new feature ? Or is it just to fight processor obsolescence ? Should I order one ? I have been able to update my Prime HW-A to version 2.0.0.13865 !! I have disabled the windows defender real-time protection (W10). Updating again went well for the real Prime as well as for the virtual Prime. I wanted to tell you this in any case. Grr .. stay busy and try, you learn in every case! Great work. I did not try yet (android) but I am happy the team is still on the product, already this is a good news! Crashing of the Virtual Calculator on MacOS High Sierra seems to be fixed, but the vanishing text bug is still in full force. This is a very nasty bug that is highly reproducible and makes the calculator almost unusable until you fix it temporarily by relaunching the virtual calculator. Please tell me what I can do to help HP fix this bug in the next release. It's really quit horrible. UPDATE: I spoke too soon about the crashing bug being fixed. It seems to crash less than the previous version but it still crashes. I wish those 2 things were the extent of the Virtual Calculator bugs on MacOS, but it isn't. Much of the time when I switch between Virtual Calculator and other apps, the calculator somehow gets stuck in Settings Mode. I click the Home button and it shows the Home Settings! I click CAS and it shows the CAS Settings! Click Blue-Shift and the CAS or Home and the same thing -- Settings! This nightmare doesn't end until I relaunch the Virtual Calculator, but I then proceed to use it, then switch to another app, then switch back and the Virtual Calculator is messed up again. It's almost unusable. I updated my HW-A to 13865 with no problem. What is G2 and who has it available for order? I have three Primes so far (HW-A, HW-C with old keyboard, HW-C with new keyboard) and want to collect all of them. Hi toml_12953, thanks for your reply. Updating was only possible after stopping windows defender real-time protection. My Connectivity Kit and Calc updated but the Prime Virtual Calculator won't connect. I got to the FTP site, which do I use for Win 10, the .exe or the .dmg and do I just run the .exe? (07-21-2018 01:10 AM)JDW Wrote: UPDATE: I spoke too soon about the crashing bug being fixed. It seems to crash less than the previous version but it still crashes. I've recently started using a more up to date version of the qt libraries and I'm not seeing the text disappearing any more... maybe that had something to do with it. Right now however, the Mac/windows emulators are basically the same as before - just updated with Core fixes and changes done through the final G2 work. Next release when/if any should have more changes and fixes in the other parts of the applications. Please send me an email to calchelp at hp.com so I can in direct contact with you for testing things. (07-21-2018 05:13 AM)harryp Wrote: My Connectivity Kit and Calc updated but the Prime Virtual Calculator won't connect. I got to the FTP site, which do I use for Win 10, the .exe or the .dmg and do I just run the .exe? I'm guessing at some point you blocked the connection in your firewall. It pops up a "do you wish to allow connection" message the first time you ran it. I suspect you clicked no, or only on home networks or something. If you unblock it, it should work fine for the future. The EXE is the file you want. (07-21-2018 05:34 AM)Tim Wessman Wrote: Please send me an email to calchelp at hp.com so I can in direct contact with you for testing things.